Posted 15th November 2016 & filed under News. Tammy Peat was last reviewed for Vodder MLD in Sept 2016 . She has been recertified in MLD/CDT therapy . Posted 7th November 2016 & filed under News. Kinesiology Tape (KT) is a one way stretch tape which when applied correctly can enhance lymphatic drainage and oedema reduction (Kase et al, 2003). KT Tape is designed to have a similar elasticity to the skin and reflect the weight of the epidermis. (Boseman and Pillar, 2010). It has been confused with athletic tape but the elastic properties of KT tape are very different in both its purpose and application. KT tapes are made from a variety of materials and in a variety of different percentages but Haddenham Kinesiology tape (which I use) is 100% Cotton with a medical, heat sensitive, acrylic adhesive backing. The adhesive has a wave form pattern which allows the skin to breathe and enhance its effect. Therapeutic effects of kinesiology taping. Reduction of abnormal skin sensations. Tammy is registered with medical insurance companies Bupa and Aviva for MLD . Posted 16th March 2016 & filed under News. The Whitehouse,3 Sandygate Park , Sheffield , S10 5TZ . Tel : 0114 2302030. The Bakewell Physiotherapy Clinic . Arden House , Unit 7 ,Deepdale Business Park ,Ashford Rd , Bakewell , Derbyshire.DE45 1GT. Posted 4th November 2014 & filed under News. 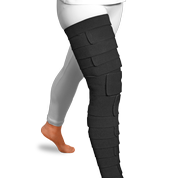 is a low-stretch medical binder used as an alternative or supplement to traditional compression . It is easy to apply and individually adjustable thanks to Velcro fasteners and it is available for lower and upper extremities in standard sizes .